With thousands of visitors descending on London in 2012, some of the city’s more aged infrastructure desperately needed upgrading. Blackfriars and Stratford Regional were among the railway stations chosen for major redevelopment. Pilkington Planar™, the innovative structural glazing system, was a key element of the new design of both stations. A vital central London interchange on the Thames link cross city route, the new Blackfriars station reopened in February 2012. Schemes to improve the station’s 1970s design had been in the pipeline for almost 20 years before the engineering and construction firm Jacobs Engineering was chosen to deliver Pascall and Watson’s concept of a brand new station. Key to the development was a new entrance to the station, on the south bank of the River Thames, in addition to a new, bright and spacious concourse area. Where Blackfriars had previously only been accessible from the north bank, the station now stretched out across the Thames southwards, making it the first station in the UK to be built across a major river. Central to the success of this redevelopment was the creative use of the Pilkington Planar™ structural glazing system. Pilkington Planar™ provided a bolted glass surface for façades and internal walls, utilising stainless steel fittings housed in countersunk holes to fix the glass directly back to the structure. The result is a fully engineered system offering all of the properties of conventional framed façades, with the minimum of visual obstructions. The realities of life at a busy central London station meant that strength, safety and security had to be incorporated into the design. Thick, toughened and laminated panes of Pilkington Planar™ security glass were combined with extra-clear Pilkington Optiwhite™, a low-iron glass panel laminated with a neutral tint. 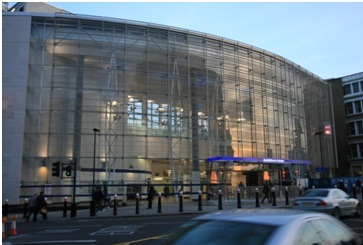 This innovative glazing solution ensured the safety of the passengers could be balanced with Pascall and Watson’s vision for a light, airy and spacious station. Pilkington Planar™ glazing was also chosen as a key material for the renovation of Stratford Regional station – ahead of the Olympic and Paralympic Games last year. The refurbished and upgraded station now incorporates a total of 650m² of the structural glazing product Pilkington Planar™. Pilkington Planar™ facilitated the construction of a new glass facade that joined the existing station to the recently completed station concourse and new platforms – allowing passengers to move between the existing Overground and Underground lines safely. An additional mezzanine was also created, providing a stunning new entrance to the station, which consisted of a 6m tall laminated glass wall supported by 19mm thick, toughened glass fins that enabled a clear view out of the station. Both projects raised the bar as examples of modern station innovation – from a key hub for the Olympics to a central London commuter station that reaches over the Thames. The use of Pilkington Planar™ sits at the heart of both and enabled the respective architects, Jacobs Engineering and Hawkins Brown, to create beautifully light and airy spaces while also ensuring that they met the necessary safety and security performance requirements. For information on the innovative structural glazing product Pilkington Planar™, please visit our product pages.